The Father has given us access to holy power and a way to bless each other through prayer if only we will take advantage of it! "May each soul be rekindled with fire from above." These words come from one of those "old time toe tappers and heart tinglers" everyone liked to sing when I was growing up. In most of those churches, people didn't talk much about the Holy Spirit. However, the hymn "Revive Us Again" is a rousing prayer. As we sang it, we were pleading for God to pour out the Holy Spirit upon us. We prayed that God would scatter and drive away our darkness. We prayed God would rekindle the flame of holy passion in each of our hearts. We prayed that God's Spirit would rouse us out of our lethargy and spiritual slumber. Whether intentional or not, singing this song was our backdoor to the grace of the Holy Spirit expressing our desire for the Spirit's power to be real in our lives. Jesus promised that the Father would give us this great gift of his presence in the Holy Spirit if we would ask (Luke 11:13). Prayers for the Holy Spirit to move among Jesus' disciples has nearly always preceded any great movement of revival or evangelism. This release of the Holy Spirit is much needed today. European churches have been diminishing in influence for more than a century. The American church struggles with decline and wrestles with consumerism as churches compete to offer the best worship experience and amenities to attract attendees. The call to genuine discipleship and sacrifice for the kingdom of God languishes. Meanwhile, many of our brothers and sisters in difficult places face persecution and death for their faith. We need to pray for the Spirit to come and lead our hearts and have Jesus reign over our lives. Part of that prayer can take its cue from the old hymn. We need to pray these words together: "May each soul be rekindled with fire from above." Unleashing the power of the Holy Spirit is a shared experience, a result of the fellowship created by the Spirit (2 Corinthians 13:12-14). This is more than individually praying for the outpouring of God's Holy Fire upon us. Gathering together and asking God to send the Holy Spirit is powerful and important. This was what happened at Pentecost when the church was born (Acts 1:12-14; Acts 2:1-4) in obedience to Jesus' command (Luke 24:45-53; Acts 1:4-8). We see this happening again in the church at Antioch as Jesus' disciples were worshiping and fasting together (Acts 13:1-3). Notice how Paul ties the Holy Spirit to fellowship (2 Corinthians 13:12-14) — see the "Closing Blessing" at the end of this message. The power of the Holy Spirit is often tied to shared worship, fellowship, and prayer. Read through the New Testament and notice all the references to the Holy Spirit. Especially notice the context of shared fellowship! As we focus on Jesus as our highest priority and in our daily time in Scripture, the Holy Spirit is at work transforming us. We can invite the Spirit to have a more influential role by doing what releases the Spirit among us, committing to grow in character and compassion like our Father, while following the Spirit's lead in our dance of life. But there is one huge dynamic still missing from this spiritual growth plan: shared prayer for God to unleash his Holy Fire into our lives. The apostle Paul was an amazing church planter. We can point to many of his practices, strategies, and principles that were important to his success. However, the one we want to embrace today focuses on his prayer life. If we seriously take the beginning and ending of Paul's letters, we realize that he prayed for so many people by name as well as the churches of which they were a vital part (Romans 16:1-20). Many letters begin with a rousing prayer of thanksgiving (Ephesians 1:3-14). Others are stitched together at their seams (1 Thessalonians 2:13-16; 1 Thessalonians 3:11-13) while beginning and ending in prayer (1 Thessalonians 1:2-10; 1 Thessalonians 5:23-24). These prayers are spoken by Paul to the Father for the good of these people and their congregations. These prayers are also shared with those same people and congregations when they met together as Paul's letter was read aloud in their gathering together in the name of Jesus (1 Corinthians 1:1-2; 1 Corinthians 5:4). As they heard Paul's prayer for them, they were invited, together, to live into intercessory targets of these prayers! Ephesians, sent to the churches of Asia Minor, shows Paul praying for these churches. 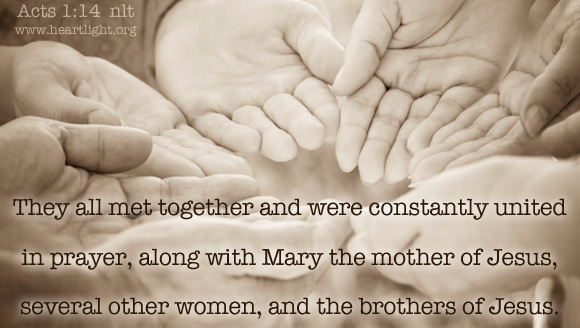 His repeated prayer for them as Jesus' disciples was for God to fill them with the Holy Spirit and with power. Near the beginning of the letter, Paul prayed that they would be able to understand God's great power at work within them (Ephesians 1:17-23). In the middle of the letter, Paul prayed for God to directly release the strength of the Spirit's might within them (Ephesians 3:14-21, notice especially Ephesians 3:16). He ended the letter by urging them to pray in the power of the Spirit themselves, especially as they pray for him and his mission work (Ephesians 6:18-20). Now, let's imagine what Paul's example could mean, and should mean, for us! We shouldn't limit our hope for God to unleash the power and presence of his Holy Fire on us to a song. While we have many songs today that help us talk about the Holy Spirit, God wants more than our singing. As important as singing is to being filled with the Spirit (Ephesians 5:15-21), he wants us to pray for the coming of the Spirit (Luke 11:1-13). He wants us to commit to gather with other believers, in big groups and small groups, and ask to be filled and empowered by his Spirit. The book of Acts reminds us that God keeps his promises about sending the Spirit when we pray (Acts 4:23-31). So, let's pray for specific people. Let's pray for specific situations. 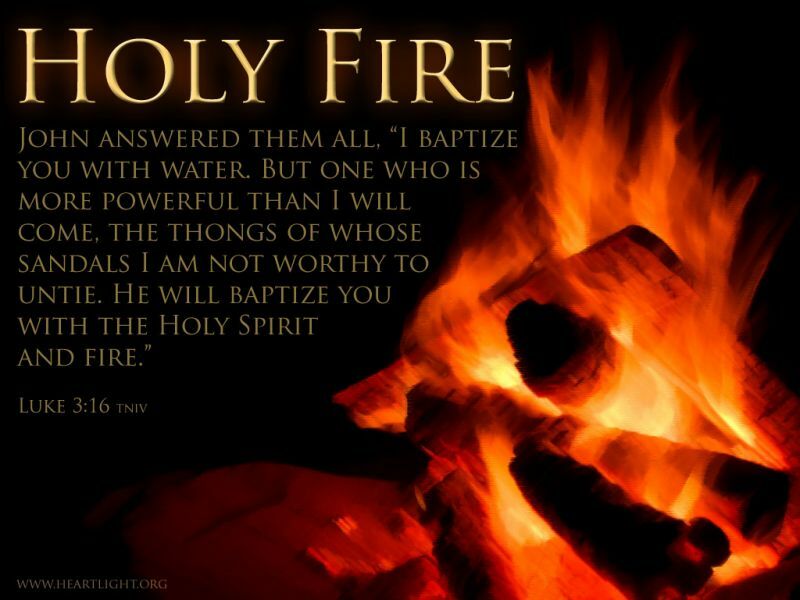 Let's pray specifically that we can know this power and be filled with this power in our inner being so we can experience God's Holy Fire personally (Ephesians 1:17-20; Ephesians 3:14-21). Most of all, we can pray for "each soul to be rekindled with fire from above" and know that the Father longs to give us this great, precious, and powerful blessing. I can't think of anything more important for us as God's people today! 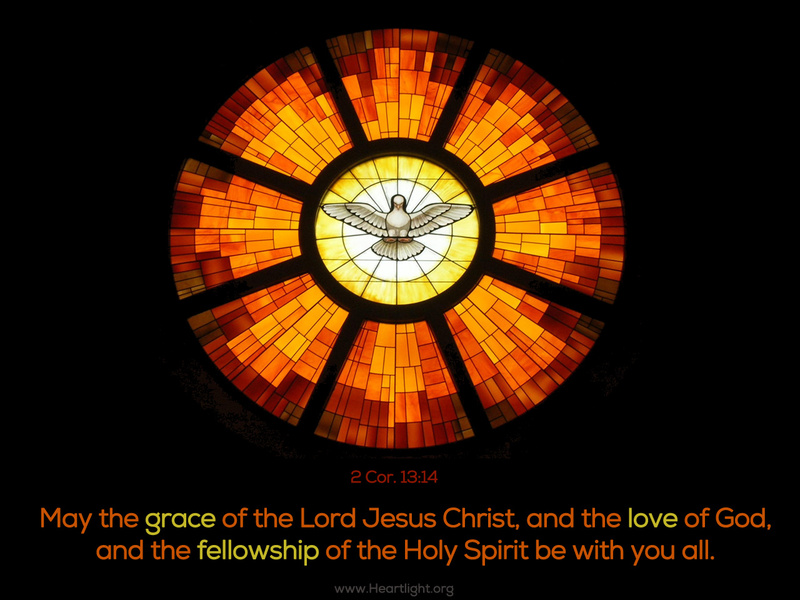 May the grace of the Lord Jesus Christ, and the love of God, and the fellowship of the Holy Spirit be with [us] all (2 Corinthians 13:14). If you would like to know more about the Holy Spirit and the Spirit's work in us, you are invited to visit and subscribe to the free daily devotional called SpiritFire. We shouldn't limit our hope for God to unleash the power and presence of his Holy Fire on us to a song. Turn Out the Lights or Light the Fire? "Unleashing God's Holy Fire" by Phil Ware is licensed under a Creative Commons License. Heartlight encourages you to share this material with others in church bulletins, personal emails, and other non-commercial uses. Please see our Usage Guidelines for more information.